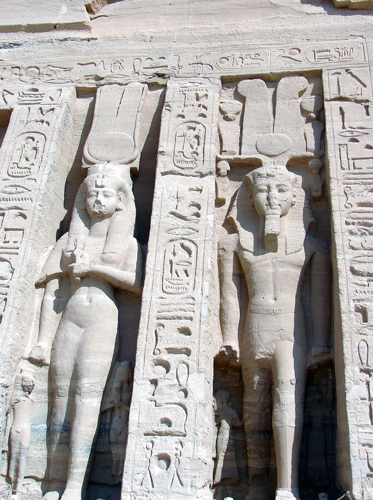 The Great Temple is dedicated to Ramesses, as well as the three main gods of the time, Amun, Ra-Horakhty and Ptah, and features four 65-ft. colossal statues of the seated pharaoh on the facade. 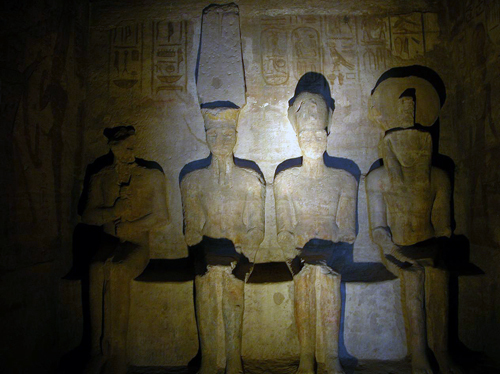 Inside the temple, two hypostyle halls lead to the spooky inner sanctuary with seated statues of the pharaoh and gods. 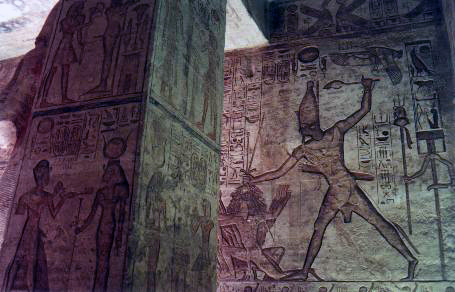 The halls through the temple are covered in bas-relief and painted scenes of Ramesses doing kingly things, like crushing his enemies and consorting with the gods, and colossal statues of the pharaoh line the walls on either side. 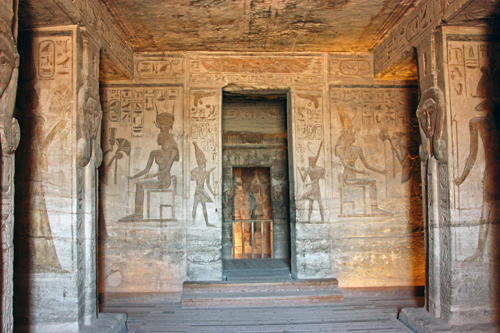 The Small Temple is dedicated to the goddess Hathor and Ramesses’ queen, Nefertari. It’s less grand but more elegant, with six 33-foot standing statues on the facade – 2 of the king and 1 of the queen on either side of the portal. 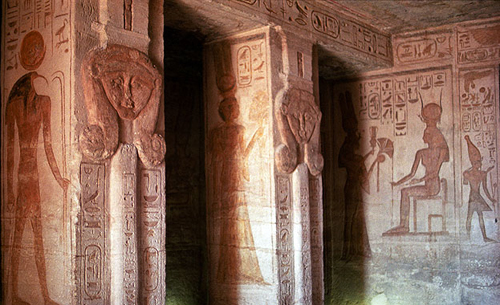 Never before or after was a queen shown the same size as the king in Egyptian art. The setting of the temples really enhances their impact. Blue water, blue sky, brown earth is pretty much all you see for hundreds of miles – forlorn, forgotten, untouched and then suddenly the temples are there like a smack in the face, in a good way. 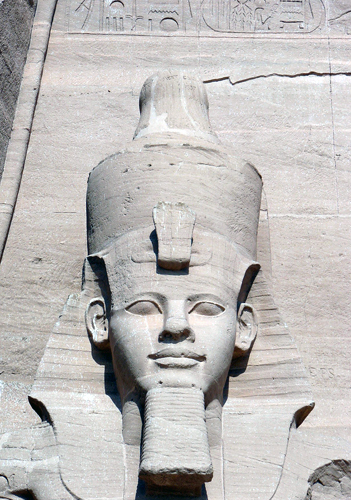 In the 1960s, the temples at Abu Simbel were moved from their original location, which was due to be flooded after the construction of the Aswan High Dam down river. 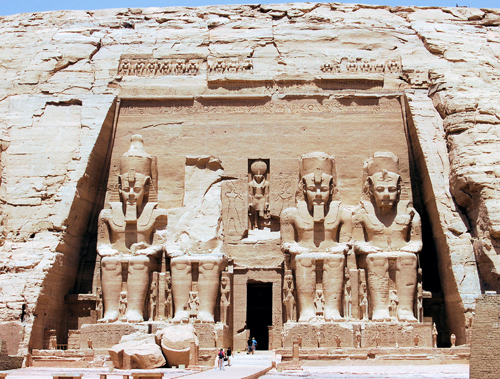 The temples were cut into 20-ton blocks and moved about 200 feet to higher ground. The temples were originally carved into the face of a mountain, so part of the move included building an artificial mountain. 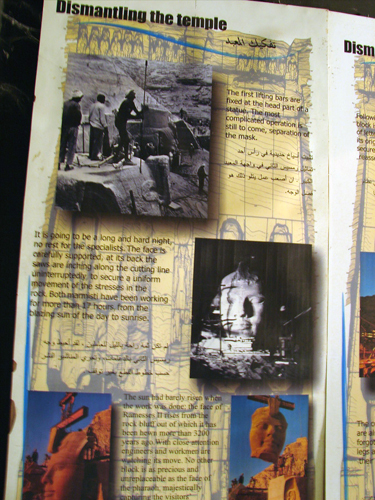 The hollow mountain is open to visitors and contains an exhibit about the temples’ rescue. 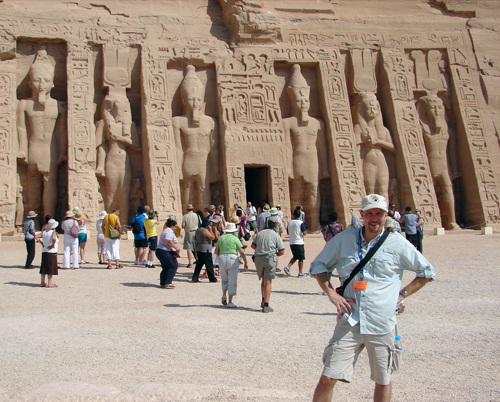 Abu Simbel is reached from Aswan by about an hour flight or a 3-4 hour overland convoy of motor coaches and mini vans. 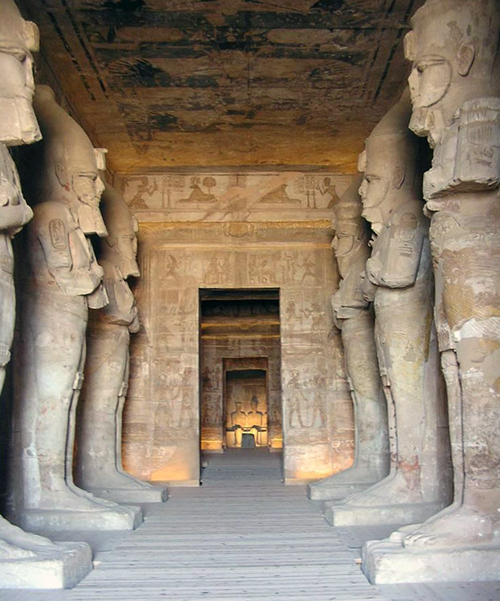 It’s also possible to cruise from Aswan across Lake Nasser to Abu Simbel. 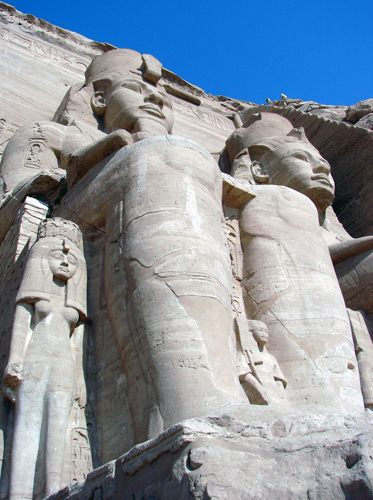 This entry was posted in Egypt and tagged abu simbel, aswan, aswan high dam, Egypt, nefertari, ramesses by yalla2013. Bookmark the permalink.